Can I use my Razer Atrox on the PC? Absolutely! Your Razer Atrox is fully PC compatible without the need for any drivers. We haven’t forgotten all the PC gamers who desperately need a phenomenal controller to step up their game. My Razer Atrox is not recognized when I plug it into my PC. There is no plans for a wireless version at the moment. What components are included with the Razer Atrox in the retail packaging? The Razer Atrox is accompanied by the product guide, alternate bat top joystick, 13ft (4m) detachable USB cable and a screwdriver for modding. What kind of modding is acceptable without voiding the warranty? Basically anything that does not involve opening and modifying the PCB. 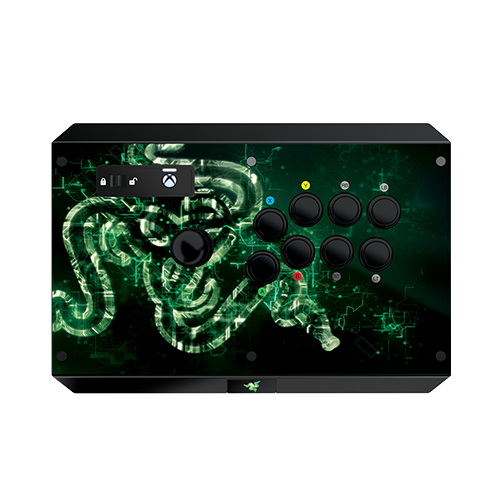 Are there any guides available for modding the Razer Atrox? Will the Razer Atrox work with a PS3 or other consoles? Nope, the Razer Atrox is only supported for the Xbox 360® and PC. Is the Razer Atrox compatible with Razer Synapse 2.0? Can multiple Razer Atrox controllers by connected to my Xbox® at the same time? I have lost and/or damaged the cable that came with the Razer Atrox. How do I go about finding a replacement? Please contact our Customer Support team here and we'll try our best to accommodate you. Will the Razer Atrox work normally on an Xbox® or PC if plugged directly into a USB hub? What are the system requirements for using the Razer Atrox? You will either need an Xbox 360® system or a PC running Windows® 8, Windows® 7, Windows Vista®, or Windows® XP - with a free USB port. Where can I find the serial number for the Razer Atrox? You can find the serial number in the inside compartment of the Razer Atrox. Press the compartment button to access the inside of the Razer Atrox. A sticker on the top right-hand corner of the hood panel shows the model number and the serial number of your device. Where can I find new artwork to replace the original top panel design? The Razer Atrox is built to be easily modifiable, allowing users to create and print their own top panel designs. You can find the blank template here. How can I install new artwork for the interchangeable top panel? The Razer Atrox top panel is secured by 6 screws, accesible on the underside of the top panel. Removing these will release the artwork sheet and the plastic layer, allowing you to replace it. If you were unable to troubleshoot and resolve any issues you are having with the knowledgebase (FAQ), do not hesitate to contact us here or call 1-888-697-2037. If you are experiencing issues with the Razer device in a particular application, test the device in another application to confirm if the issue is specific to that application. If the Razer device functions properly in another application then the program is likely the cause of the issue. Please feel free to contact customer support here to report the issue and see if there are any fixes or workarounds for the issue. What does the Lock Switch do on the Razer Atrox? Setting this switch to "Lock" will disable the Start, Back, Xbox Guide, and Turbo Buttons. However, all previously assigned turbo functions will remain active. What does the Control Switch do on the Razer Atrox? The Control Stick switch allows you to change the functionality of the joystick to emulate the Left and Right Analog Sticks, or the Directional pad for the standard controller. What do the Turbo Buttons do on the Razer Atrox? The Turbo button allows you to hold down a button instead of tapping that button repeatedly. Turbo 1 is activated when the button is pressed once--the turbo button will have a steady light to indicate the activation. When held down, the action button will perform an action four times per second. Turbo 2 is activated when the Turbo Button is pressed twice--the light will blink to indicate the activation. When held down, the corresponding action button will perform the action eight times per second. How do I change the knob on the joystick of the Razer Atrox? Align the flat tip of the included screwdriver to the bottom side of the joystick and hold firm, while unscrewing the top knob of the joystick. To replace, follow the same steps to hold the shaft firm in order to screw on the top.